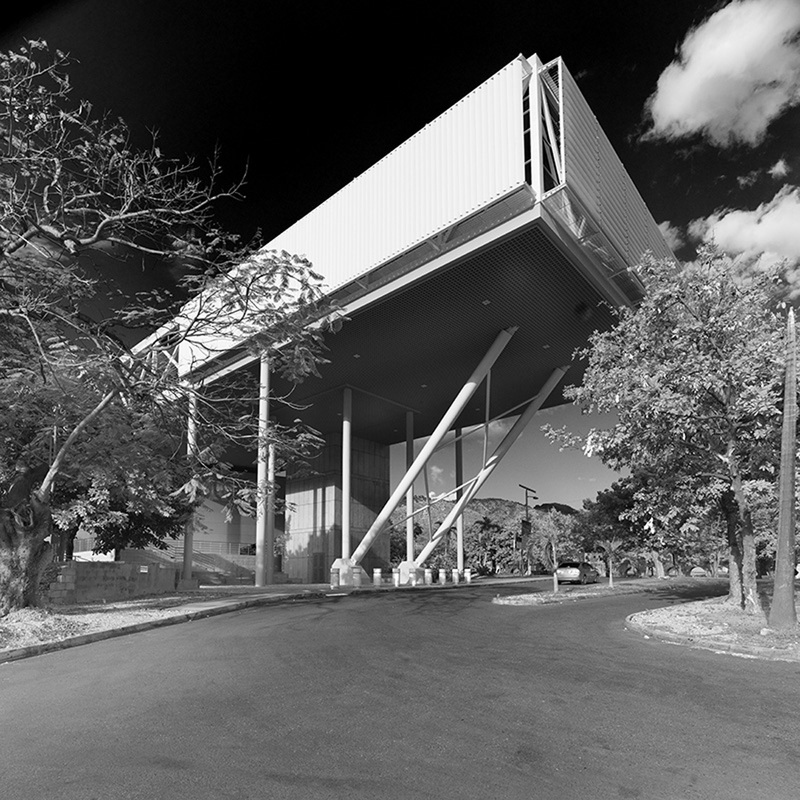 19.1 WHY CONTEMPORARY CARIBBEAN ARCHITECTURE? 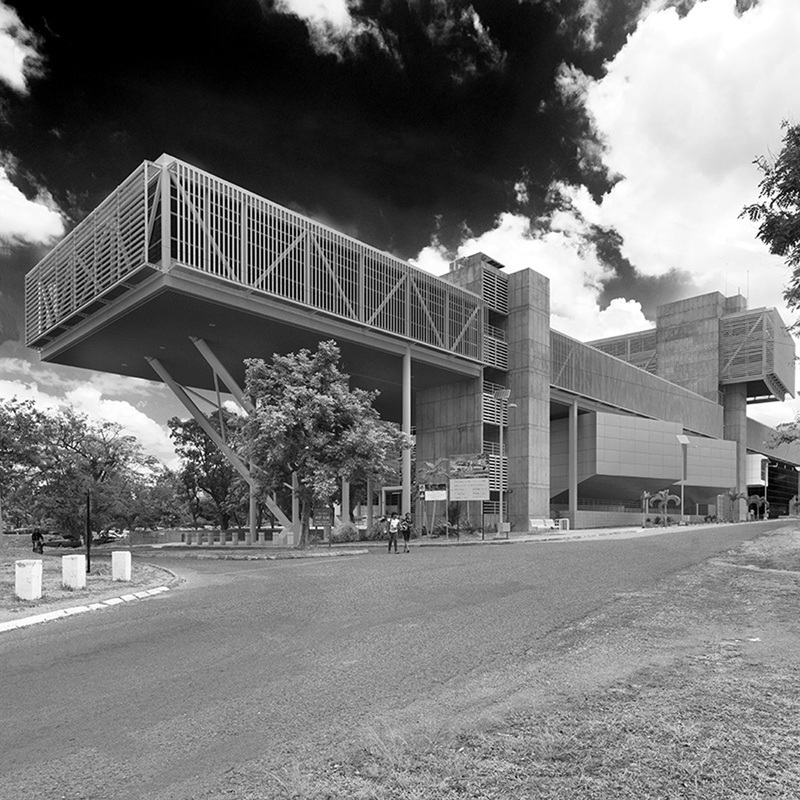 Within the Mona Campus of the University of the West Indies is the newly completed Medical Sciences Complex designed by Harold Morrison-Robert Woodstock Associates Limited. 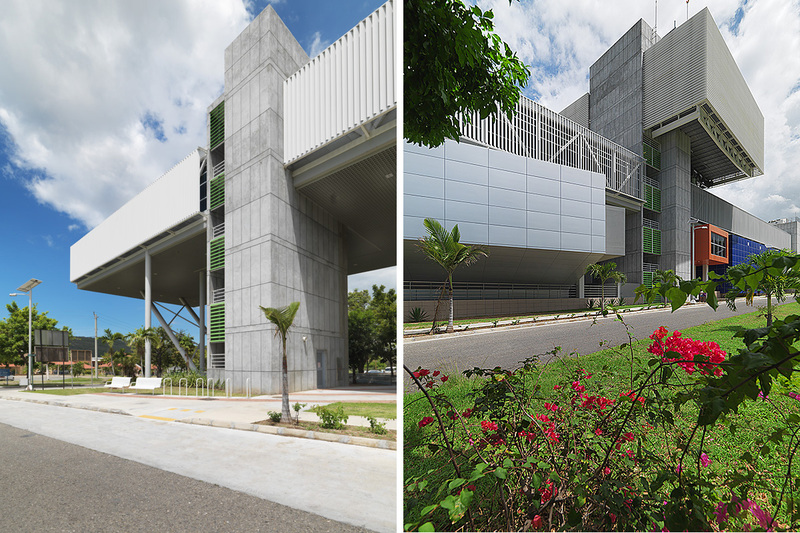 The project accommodates specialized programs for various departments [anatomy, biochemistry, pharmacology, physiology, forensic DNA and physical therapy] along with lecture halls, classrooms and teaching laboratories. The complex is planned in four sections: a linear eastern block, a central east-west block, a northern section, and two southwestern blocks to be constructed in a second phase. 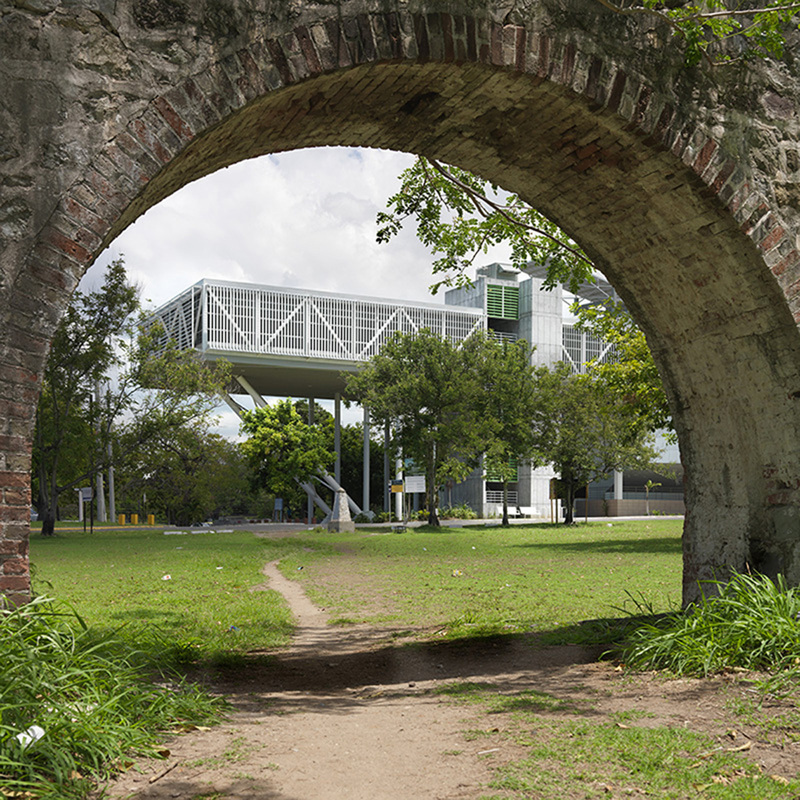 These blocks frame two major “open to sky” spaces: the main central plaza in front and a linear lawn behind. 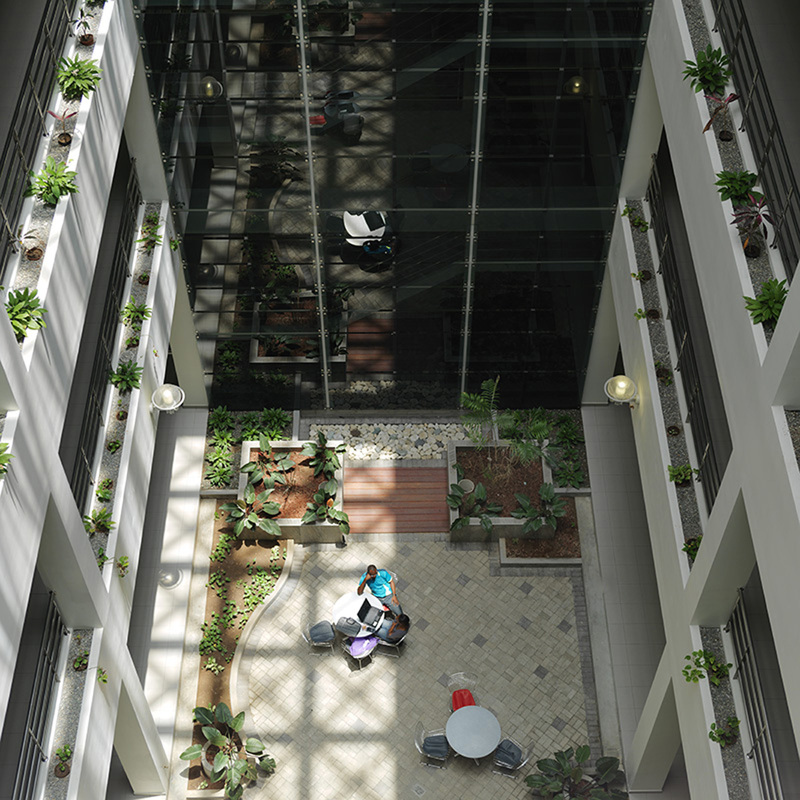 There are two atria that act as light wells to bring natural light to the lowest levels of the building through skylights. 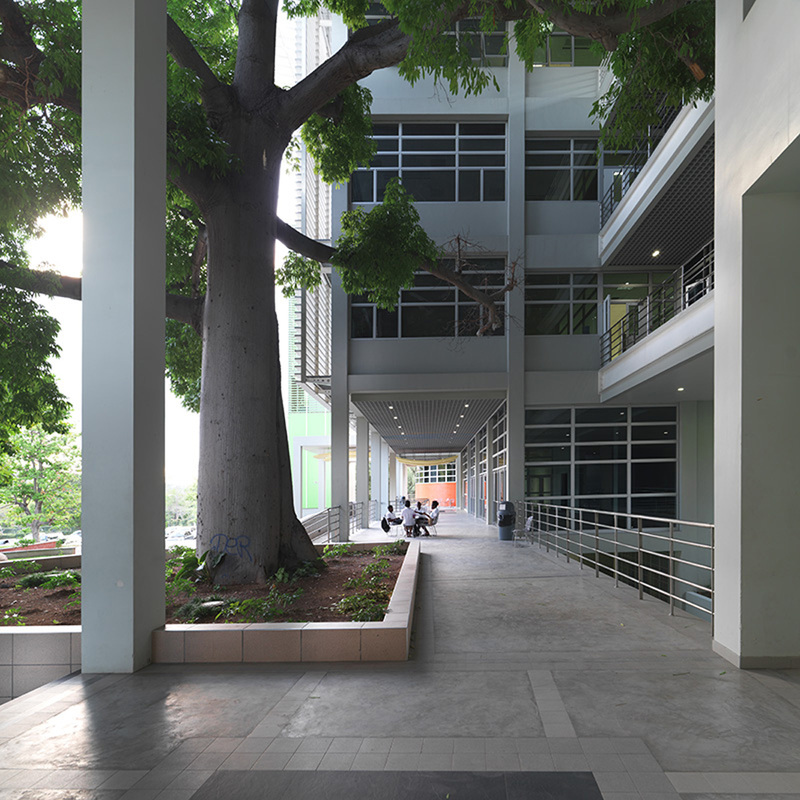 A grove of existing ackee trees known as “ackee walk” was preserved to form part of the central plaza and pedestrian entrance to the facility. 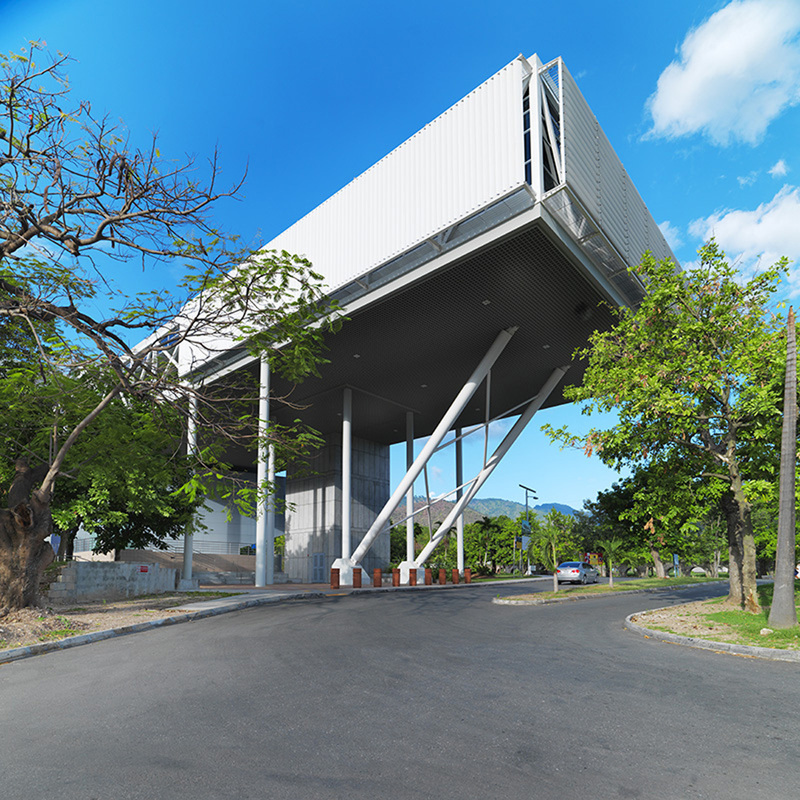 Also integrated into the facility is a huge cotton tree. Both the ackee and the cotton trees were preserved because they enjoy a significant part of Jamaican culture and folklore. 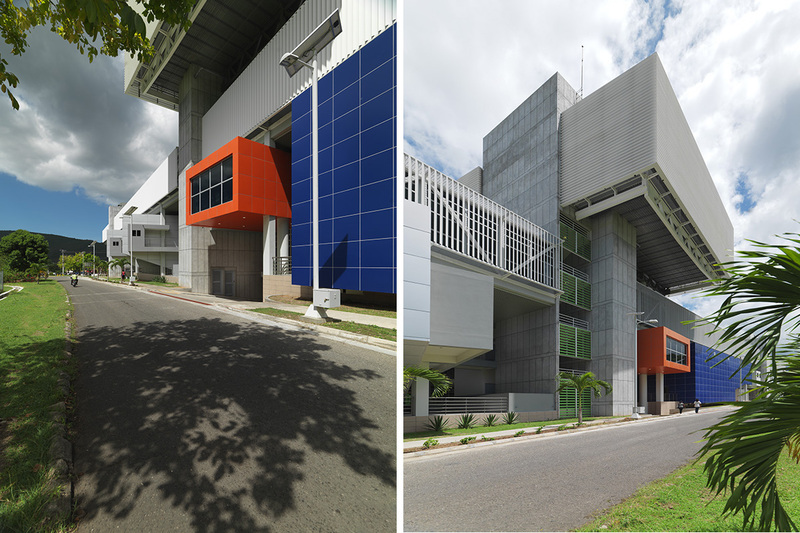 The design of the façade addresses the climatic conditions employing both horizontal and vertical sunscreens to control solar gain and to form protective screens against flying debris during hurricanes. 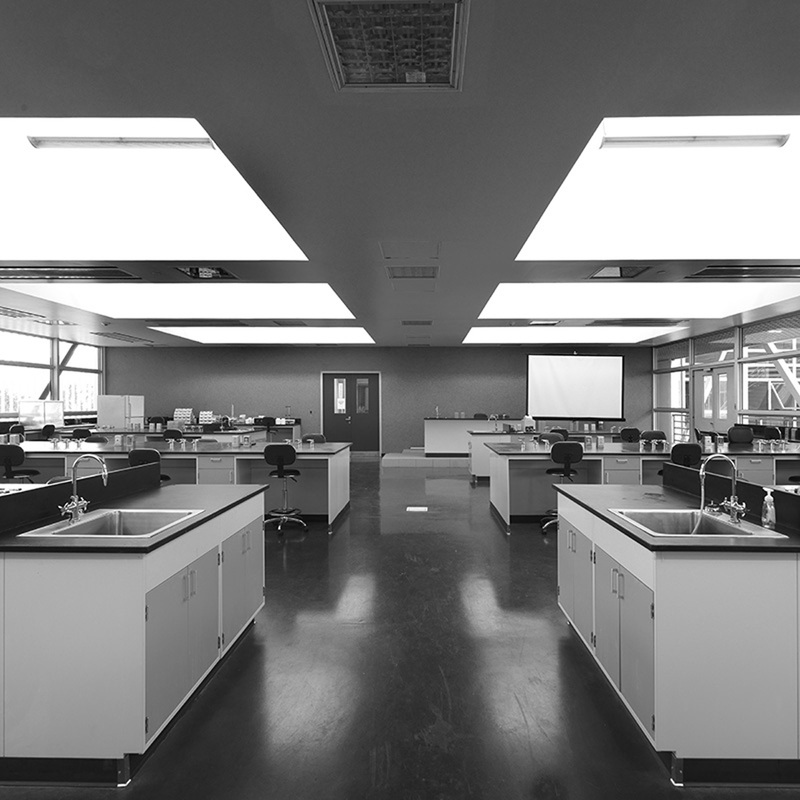 The use of natural daylight is important throughout the project with skylights in the labs and naturally illuminated atria. 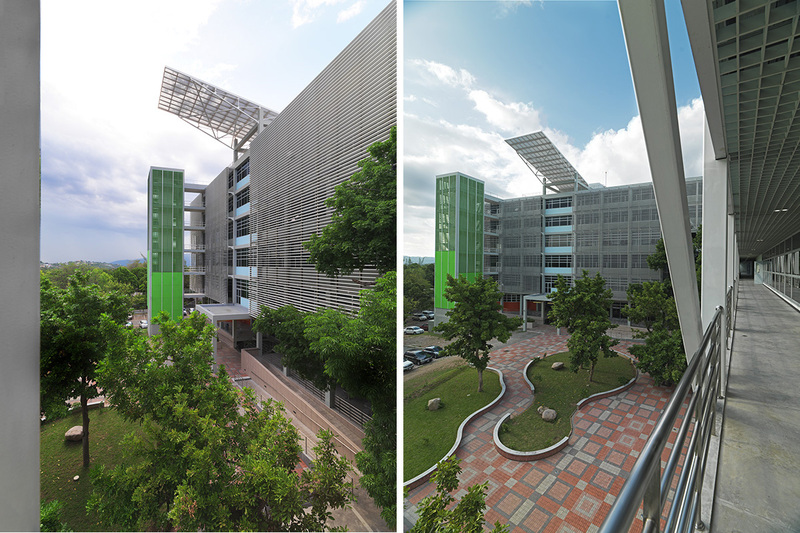 The project employs a number of sustainable design features some of which are rainwater harvesting, grey water re-use, green roofs, solar water heating and photovoltaic panels. 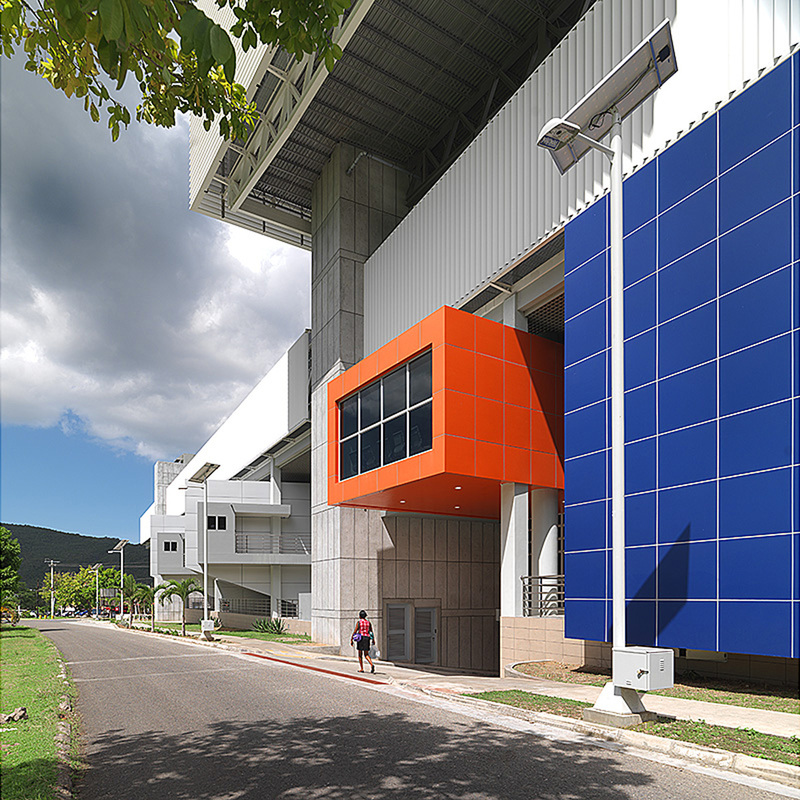 The design incorporates the innovative use of chilled beams for cooling, representing probably the largest installation of this relatively untried low energy method of cooling in the Caribbean. “So little time … so much to do”. This really should have been a 3-5 day photographic assignment. We arrived at about 9:45 AM and left at about 5:30 PM with a 2-hour lunch break [to catch a shower] and managed to shoot off a mere 269 images or about 40 pictures an hour including the time to set up a tripod for each exposure! I am not saying that this is how I would like to make pictures but that’s the time I had there and I really had to move fast to cover a lot of ground. Still, the building is very photogenic and I managed to make what I think to be a number of half-decent images in the short time available. Challenges included varying weather conditions with cloud cover just when the shutter is about to be squeezed. The sun was not in the best position in May for the dusk shot of the frontal elevation – it would be in a better position towards the end of the year. 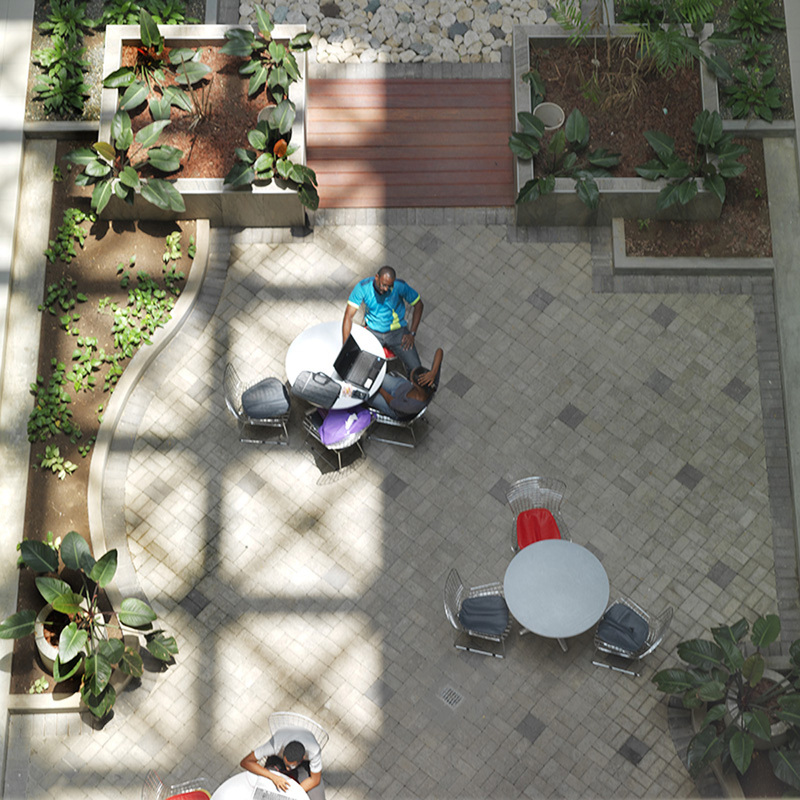 Finally the project is recently completed and the landscaping is still being installed. To avoid the problem areas in the foreground I either tilted the camera to get dynamic compositions or it was a question of Photoshop grass. 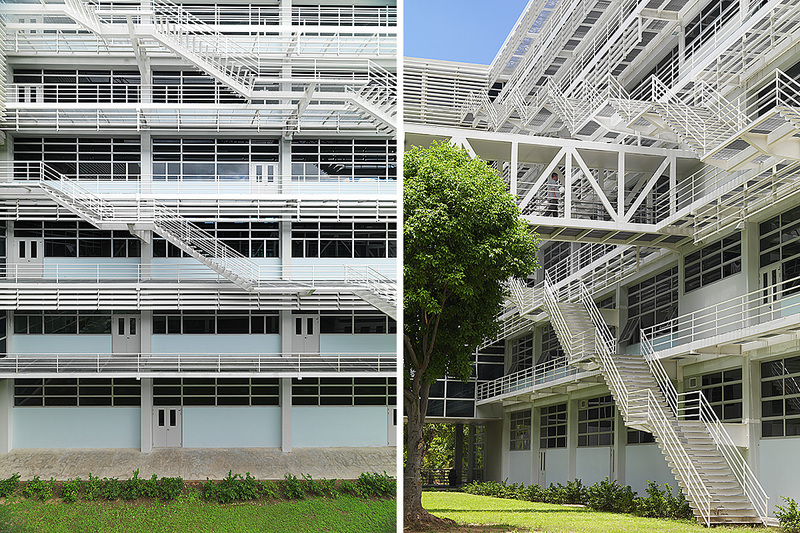 The building is still being commissioned and there were lots of temporary wires straddling across lots of vertical and horizontal louvers – a Photoshop nightmare but it was an opportunity to sharpen my cloning skills! An interesting project to photography, I would love to return in November or December for at least 3 days when the sun is in a more flattering trajectory to do the project justice.